Oh Canada, we have a new berry. It’s big, it’s blue and it’s easy to grow, from Northern Ontario to downtown T.O. Haskap’s Japanese name, haskapu, translates as “Little present on the end of the branch.” That’s where the long, oval berries congregate, hidden beneath branches of flat green leaves. Haskap tastes like a blueberry, raspberry and black currant rolled into one spicy, sweet-tart mouthful. It’s also prized for its nutritional value, containing three times more antioxidants than highbush blueberries and more vitamin C than an orange. My experience growing haskaps has been sweet and sour. After waiting three years, I was really excited to see the first blue berries on my two little bushes in mid-June, but was advised to wait a bit to ensure they were perfectly sweet and ripe. Four days later, I went out to harvest my crop and couldn’t find a single berry, blue or green. I’m not sure if squirrels, birds or raccoons were to blame — I don’t think it was the neighbours — but whoever stole my berries was a neat eater. Haskapa commercial director Liam Tayler saved the day, sending me a bag of frozen berries from Lunenburg County, N.S., so I could make today’s recipe. The season is only two weeks long. Dark, intense haskap juice is so complex it will knock your taste buds for a loop on first sip, while the dried berries look like raisins and taste a little like dried apricots. Of Ontario’s 35 growers, Boreal Berry Farm and Winery in Warren, between North Bay and Sudbury, is the largest with 60 acres (24 hectares) of fruit. Co-owner Mira Melien freezes most of her 20-tonne harvest to make jam, juice and wine throughout the year. Alas, just as she was preparing to harvest this year’s late but abundant crop of berries the first week of July, a heavy rainstorm ruined the crop. 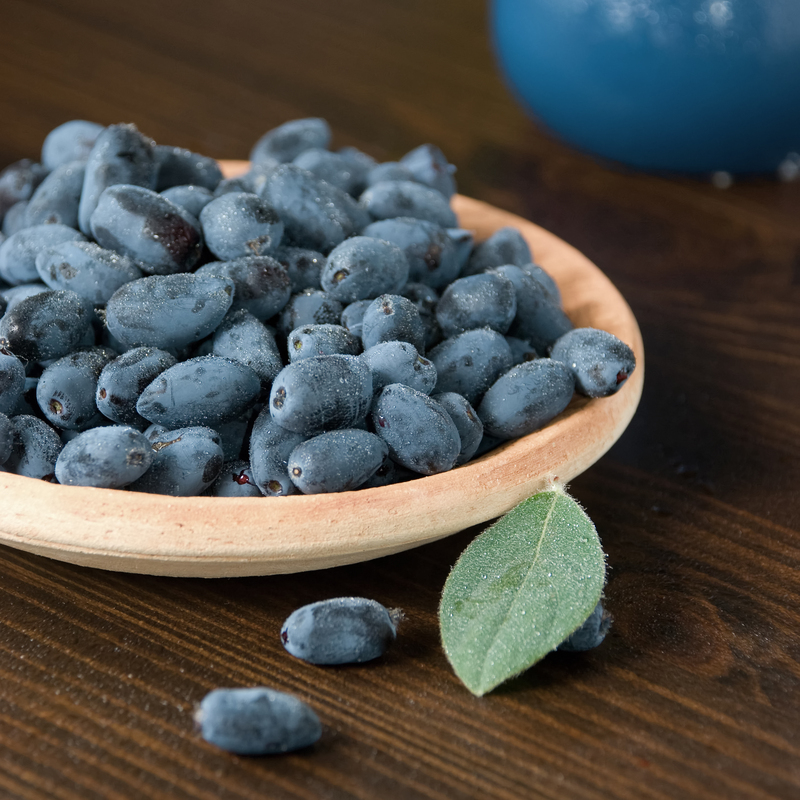 Popular in northern Japan and Russia for more than a century, haskap is also known as blue honeysuckle or honeyberry. The hardy bush was introduced to Canada around 1967 and now grows across the country thanks to new varieties developed by the University of Saskatchewan. “We have some varieties from Poland that are sweet as strawberries,” says Tayler, whose Nova Scotia-based LaHave Natural Farms sold 12,000 plants to other growers in 2011 and 250,000 this year. Wash fresh haskaps just before using and enjoy within two or three days. Like all berries, they freeze well. Check out Haskapa’s dried haskaps, award-winning juice, jalapeño haskap relish and haskap chutney at McEwan Foods, Scheffler’s Deli in St. Lawrence Market and other shops listed on haskapa.com. Use in any recipe that calls for blueberries, from muffins to quickbreads. Stir into yogurt or top cereal. Blend into a smoothie with raspberries, milk and ice. Rehydrate dried haskaps to use in baking. Dark crimson haskap juice has an intense, complex flavour. If you’re in Halifax, N.S. this summer, try haskap ice cream at Dee Dee’s. Boreal owners sell haskap wine on their Northern Ontario farm. Look for haskap or honeyberry plants at local garden centres. Buy two different varieties so they’ll produce fruit. Expect to wait three years before any significant harvest. By seven years, well-tended bushes can each produce six kilograms of fruit. Don’t pick the berries when they first turn blue — leave a few days until they’re ripe and sweet with red flesh while keeping a close eye out for predators. 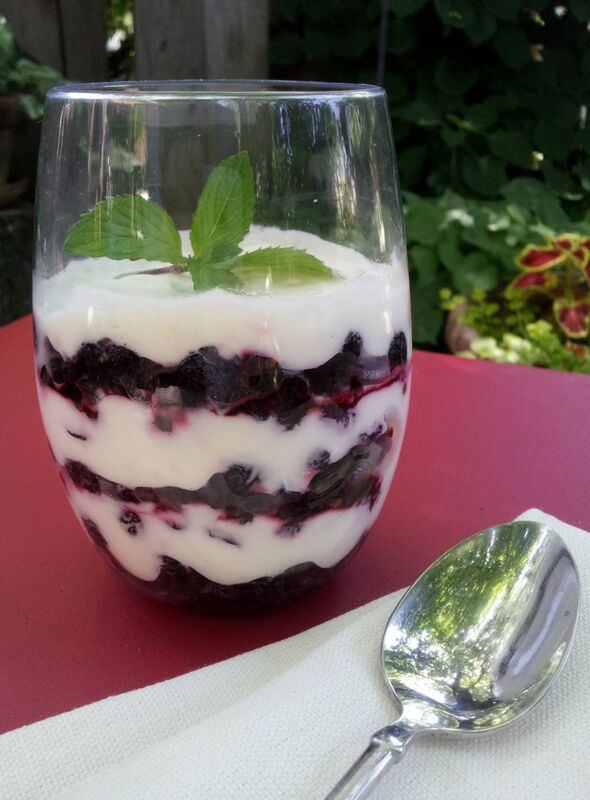 Celebrate summer with any Ontario berry layered with a light, creamy mousse. Leave haskaps whole but slice strawberries before using. Adapted from Foodland Ontario. In microwave-safe bowl, microwave chocolate on medium for 2 minutes, or until almost melted. Stir to melt completely. In large bowl, combine sour cream and lime juice. Stir in melted chocolate. Cover and refrigerate 30 minutes or until thickened slightly. In chilled bowl, beat cream with electric mixer until stiff peaks form. Fold into chocolate mixture. Refrigerate until serving time. Layer berries with chocolate mixture in six pretty glasses. Repeat layers. Top with a mint sprig and a few extra berries, if desired. Serve immediately or cover and refrigerate up to two hours. Published July 25, 2014 in the Toronto Star. I can only assumethat you are back home. Am I right? Much love. Thank you Cynthia. I did see this after I returned from vacation. Thank you so much for the support. Great story. So glad to see that you are back at work – trip to Portugal!! Call me when you have time for a pizza. Thank you for this lovely article about haskaps. It’s so interesting, especially since I had never even heard of them. I was so sorry to hear about Sandro – just heard the other day. I know you had a very difficult time for a number of months and it must be difficult now too. Hope you are doing okay. Although it may not appeal to you, if you ever need a good listening ear, I can provide it! I really enjoy your blogs and articles, and am always learning a good deal. Your dessert looks mmmmmmmarvelous! What a great photo, article and introduction to a new fruit: haskaps! Where can we find them sold in Toronto? I’ve read that haskap berries typically need 2-3 WEEKs on the bush to fully ripen after they first turn blue. Hi Tim, I hope to find out next year once I have my anti-animal and bird protection in place! !